Previously we had shared a 99¢ app bringing shortcuts to different parts of the Settings panel you could install on your non-jailbroken iPhone. 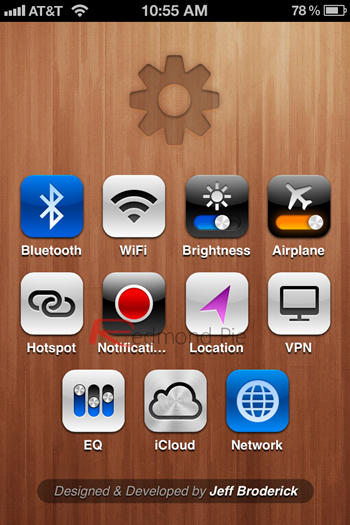 The custom shortcuts gave you SBSettings-like access on your iPhone Home Screen, granted, with limited functions. Now a free, web based alternative can be placed on your iPhone which does essentially the same thing as the paid app. The simplified design is credited to Jeff Broderick. If you’d like, follow him on twitter @brdrck. Tweets have already poured in thanking Jeff for a job well done. Step 2: Once the page loads, click on the arrow-leaving-the-box icon. Sorry, not really sure what that icon is called. 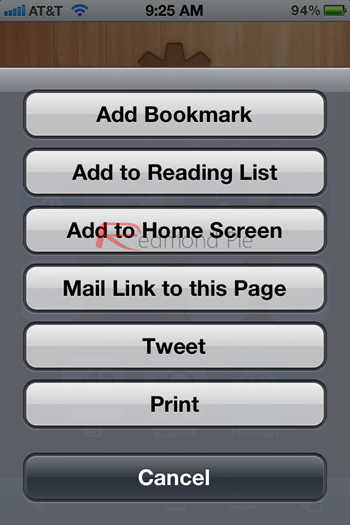 Step 3: Click on ‘Add to Home Screen’. Once the shortcut is added on your Home Screen, you can drag it to the first page of your iPhone or just keep it where it is. 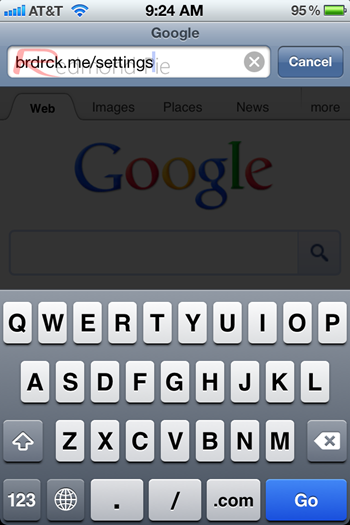 After using the web-based shortcut on my iPhone for a while, I don’t see myself using it. I feel I can navigate to the settings panel and find options quicker than waiting for the web page to load. Also, some shortcuts don’t seem like shortcuts at all. For example, as a frequent flyer, I use Airplane Mode quite often. To access this mode with this new web-based shortcut system, I would click on the new app on my iPhone then click on the Airplane icon. Two steps. Normally I would click on my Settings panel, and then click the Airplane Mode toggle switch. Two steps. In all fairness, there are shortcuts that would save you an additional tap or two. Not all the settings are found in the web settings app. Since it’s free, though, there’s no harm in giving it a try. It may prove useful if you use the more complex areas of the settings panel, such as the notification area and Bluetooth screen. If you’d like more advanced settings, you’ll have to jailbreak your iPhone and install SBSettings. For now, this is a good alternative. Let us know in your thoughts on our Facebook and Google+ pages.